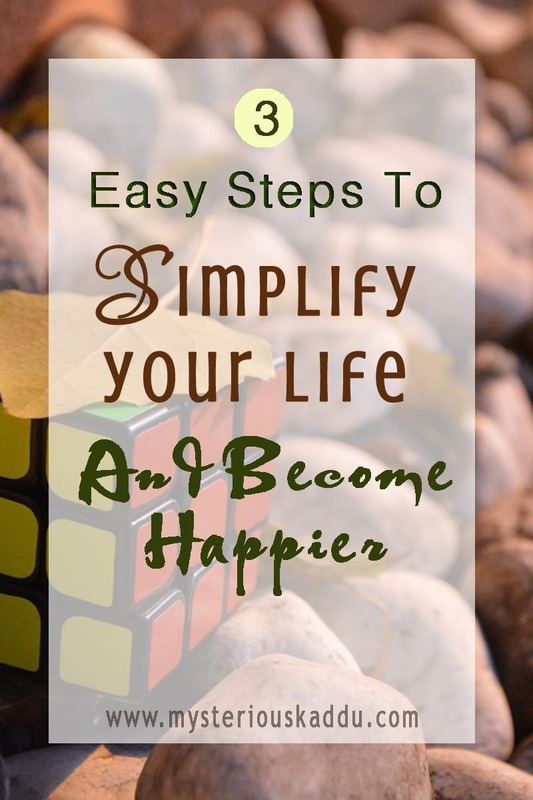 These days, you see practically everyone on the internet talking about simple living and its benefits, and how it brings more happiness into our life. But to actually apply this concept in your life, you first need to understand what exactly do they mean by "simple living". Simple living is usually thought of as minimalist living or spartan living, or even miserly living. You'll see a lot of people today advocating minimalist style of life, in order to become happy. Give away ALL your possessions. Cut off from the world. In short, go to the Himalayas and live like a monk! Personally, I don't see anything wrong in doing that. I think it would be an immensely empowering experience to be so self-sufficient. But, if everyone took off to the Himalayas, wouldn't it get too crowded? Jokes apart, I have a slightly different interpretation of simple living... a SIMPLER interpretation. Every individual in this world is different. And we all have different roles to play in the grand scheme of things. So how can one size fit all? It can't. I believe that simple living is all about removing the UNNECESSARY clutter and noise from our life. The stuff that we don't really NEED. The stuff that DISTRACTS us from what is really important in our life. If a car helps you do your work more efficiently and lets you spend more quality time with the people who matter, then what's wrong in keeping a car? If using a mixer-grinder-juicer in your kitchen allows you to eat healthier, then why give it away? If outsourcing your cooking gives you more time to do stuff that gives you greater satisfaction, then what is the harm in it? If an internet-enabled smart phone lets you make video calls to your grand-children, halfway across the globe, then how can it be a bad thing to have? Simplifying our life doesn't mean that we give up all worldly possessions, dreams and desires. It just means that we set our priorities, and then align our life with those priorities. It is a simple 3-step process. Personal goals - They could be related to health, travel, education, hobbies, etc. Professional goals - What are your career ambitions and financial targets? Relationship goals - These would be about marriage, kids, social clubs, etc. How big a social circle do you need? How often do you need to socialize? Once you have listed down your goals under each head, you need to make sure they are not in conflict with each other. For example, if you want to have a large family, then having a large social circle also might just not fit in. Or, say you want to head a multi-million dollar empire, then chances are you might not be able to spend much time with your kids. In such cases, choose what is more important to you. Identify what you need for those goals. Life is not really as complicated as people make it out to be. You just need to decide clearly what you want most, and then go after it. In other words, break down your goals into smaller goals, and then go after those smaller goals without holding yourself back. Do you need more sleep and exercise? Or maybe a course in photography and a new camera? Or a new job with flexi timings? Or perhaps you need to move to a smaller town, so you can afford a bigger house for a bigger family? Figure it out in simple actionable statements. And then, just get on it. 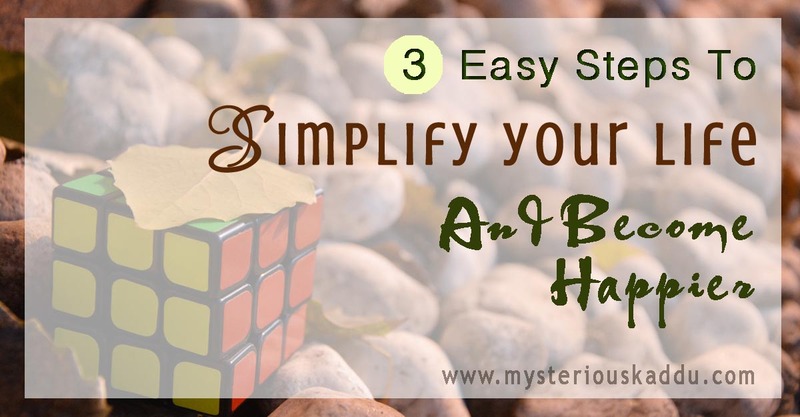 Okay, so when I said above "3 *easy* steps to simplify your life", I didn't mean they would be easy to implement. All I meant was that they are easy to understand. So you know WHAT to do. But, this last (third) step in the process, is not at all easy to do. And I speak from experience. 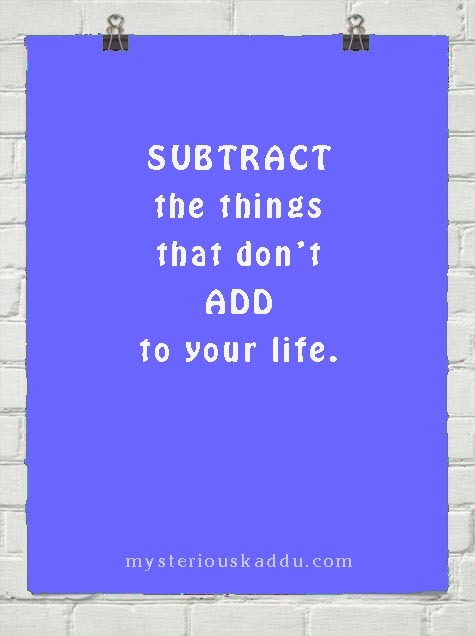 When I say "remove everything else", it means that you have to let go of all the habits, beliefs, possessions, and even relationships (Yes, those too! ), that don't align with your higher goals. But old habits are difficult to give up. And old belief systems, even more so. Most importantly, you need to let go of all the secondary goals that conflict from your higher goals. Majority of them will anyway be things that the SOCIETY expects you to do, not what YOU want to do. Yes, this won't be easy. But this is all the difference between a "simple life" and a "complicated life"... a "stressed life" and a "happy life". Well, we do have certain tools that can help us keep our mind free of clutter, and, consequently, our life too. These are our three sharpest tools for simplifying our life. Always try to be mindful in life. Watch what/who you let into your life. Watch WHY you let them in? Do they take you closer to your goals? Or do they deviate you from them? Always be grateful. Make it a habit of appreciating what/who you have. And remember how they are helping you fulfill your dreams, how they are making your life more comfortable. Be firmly resilient. If you identify that something/someone is important for you, then commit to them. Do not let go of that thing or that person. Do not let anything/anybody else come in between you and what makes you truly happy. Do you believe that simple living is essential for happiness? What ways do you adopt to simplify your life? Have you got all your priorities sorted out in life? Do you need all of what you're chasing after? Do you need all of what you already have? This is my 19th post for A to Z 2019. Love this, Chicky! I totally believe in simplifying our lives. It all gets way too cluttered and complicated. I'm a messy person and always will be, I'm afraid. Being creative with a mind that flits from idea to idea doesn't help. It does help to declutter from time to time but I don't think I'll ever be cured. LOL! Oh well! I do try to buy less in hopes that will help. Love those last three points you have on mindfulness and being aware of who and what you let into your life and whether they are adding joy or taking away from your goals. Good reminders. I liked how you mentioned that it's okay to keep things like our cars and phones if they're adding to our quality of life and bring us joy. We need a car out here where we are. It's a long walk into Ottawa and no buses so we're stuck that way. I do like living out in the country though and enjoy simple walks in nature more than the noise and crowds of the city. Another wonderful post, Chicky! Good for you! This is my most favorite post on your blog. I have always been a hoarder. No matter how hard I try to reduce the clutter I end up accumulating more. But I realise that there are somethings that I really can't do without. Your logic makes sense to me. If a smartphone allows me to be connected with my relatives abroad why should I throw it away. Rather I should decrease my social media addiction that has grown due to the smart phone. Its about deciding how to make the best of what you have while eliminating the non-required stuff. Good points about setting priorities and establishing what's important to you. Some people want to drive fancy cars and live in large, showcase homes. We prefer to spend our time and money on other pursuits, like travel. So, our cars are older and our home is small. Some people may look down on us because of that, but who cares? Material possessions are overrated, IMO. In a way, this is also the idea behind decluttering. Another simple way of determining what stays and what goes is "have you used it in a year?" This applies to everything, not just possessions. If the answer in a particular situation is no, then probably it's just taking up space in your life. I know, Cathy. Everybody tells you to keep a clean desk, keep everything in place, but some people like messy. They work better in messy. It is their source of inspiration. For them, messy is simple. That's why I feel we all should simplify our lives in our own way. Car is a necessity where I live too. Giving it up would mean complicating our life unnecessarily! Exactly, Debbie! Besides, if our priority in life is to travel, then who would take care of a big house and fancy cars? Life is not really as complicated as people make it out to be. this is so true. 10 things that we all can do little less : each and every point rings true with me. they are not so difficult by with practice life will be serene. This makes a lot of sense, Chicky. A very detailed post too. I do agree that simplifying life does not mean giving away things that are bringing us joy and giving us an opportunity to make our lives easier. Oh how I wish I could do the grow your own food bit :). Resilience I believe is one of the strongest tools to have in your arsenal. We all are so much stronger than we let ourselves believe. From the post, I think there is a great amount of wisdom in cutting ourselves off from all the distractions. It helps us identify the key priorities and the most important factors which really define who we truly are internally. It becomes so much easier to deal with the everyday stress for most of them fall under the not important category. I quite liked all of what you wrote. I live pretty simple by normal standards but you know where the real clutter is. Exactly where you pointed it out. Those ten points are great. This is the kind of post that I need in life. I've always been a hoarder. I don't know how to let go of things or people. Let me see if I can start working on this one step at a time. "Say YES less" is super important :) But I agree with the rest too! Too many people follow life advice without looking at the context (e.g. having a car). Great post! Usually, simple living is believed to be giving up on worldly possessions and living with the bare minimum. I liked the examples and perspective you have shared on simple living. Great post thank you Kaddu/Chicky! Saying YES to life and all that it offers is my way of being in gratitude. I try to simplify things in some ways, eg distinguishing between 'want' and 'need' - I may WANT eg a new lipstick but do I really NEED it .. Simple Living, high thinking! I believe in this Mantra. I used to clutter my cupboard with lots of unnecessary stuff. 2 years back, I took a stock of all that and donated most of the usable stuff in good condition. Now I try to be conscious of what I need and what I have. The middle path is important than going to Himalayas - well said.